TENNIS: World No.1 Andy Murray says he will have to improve if he is to defeat Stan Wawrinka in the French Open semi-finals tonight. Murray was not at his best but came back from a set down in the quarter-finals to defeat Kei Nishikori in Paris 2-6 6-1 7-6 (7-0) 6-1. Tonight's clash will be a repeat of last year's semi-final which the Briton won in four sets before going on to lose to Novak Djokovic in the final. 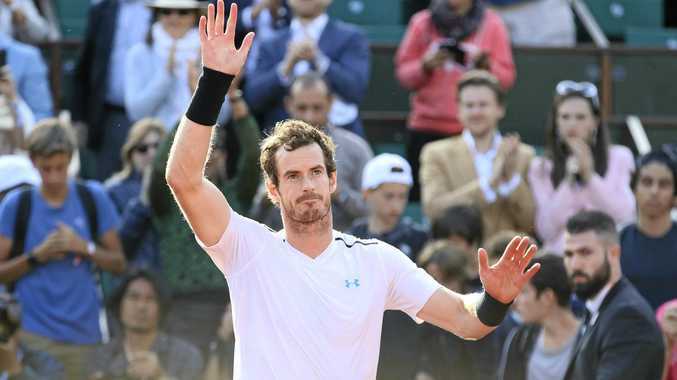 The clash against Wawrinka will be Murray's fourth semi in a row at Roland Garros, while the Swiss star, who won the title in 2015, is in his third straight semi-final. Murray said he would need to be at his best if he was to beat Wawrinka, who defeated Marin Cilic 6-3 6-3 6-1 in his quarter-final. "Stan has played fantastic this tournament so far," the Scot said. "Last year when we met he was playing very well and I had to play one of my best matches on clay to beat him. "It's not always been easy for me here but the last few years have been great. "I didn't feel like I played great tennis today. It's a huge step in the right direction for me. "Anyone can win matches when they are playing well. It's winning when you're not playing your best is more impressive." In the other semi-final nine-time champion Rafael Nadal will take on Dominic Thiem after the Austrian knocked out defending champion Djokovic 7-6 (7-5) 6-3 6-0. Thiem knows he has a huge task to try to dethrone the king of clay but after a win over the Spaniard on the surface at the Rome Masters. "It's great for me to be in the semi-finals again, to defend that," he said. "And of course on Friday is coming the toughest opponent ever here in Roland Garros. Going to be the fourth match against him in five or six weeks. He's again in his best shape. "Do I feel ready to win a Slam? Difficult question. So far when I have beaten a top guy, I have always played a way worse match the following day. "So I hope I can improve that. I mean, it's a joke how tough it is to win a slam. "Obviously now I beat Novak. "On Friday is Nadal. In the finals there is another top star. That's why it's a slam - because it's such a tough achievement."